[Episcopal News Service] San Francisco this week has become the epicenter of the movement in the United States to take greater action against climate change, and the Diocese of California’s Grace Cathedral is playing a prominent role in the upcoming three-day Global Climate Action Summit that is spearheaded by California Gov. Jerry Brown. Thousands of activists, experts and people of faith are in the city this week for the summit. Many of them, including Episcopalians, participated Sept. 8 in a major march in San Francisco that was part of a series of worldwide demonstrations known as Rise for Climate, Jobs and Justice. Hundreds of people are expected to attend a kickoff worship service to be held Sept. 12 at Grace Cathedral. Affiliated workshops and other events already are underway around the city, including at the cathedral. “The environment and climate is a hugely important issue for Grace Cathedral,” said the Very Rev. Malcolm Clemens Young, the cathedral’s dean. The cathedral’s capacity is about 2,000 people, but it rarely reaches that many except on Christmas and Easter, Young said. He isn’t sure how many will attend on Sept. 12 but expects a full crowd at the 4 p.m. service, which is described as a Multi-Faith Service of Wondering and Commitment. Episcopal Church Presiding Bishop Michael Curry and the Dalai Lama each will contribute remarks at the service by video. House Minority Leader Nancy Pelosi, D-California, is scheduled to speak, as is Patricia Espinosa Cantello, executive secretary of the United Nations Framework Convention on Climate Change. Brown and Lt. Gov. Gavin Newsom have said they will attend, as will California Bishop Marc Andrus. The service also will highlight faith-based efforts around the world to care for the planet, including the several related resolutions passed in July by the Episcopal Church’s 79th General Convention. The 2015 Paris Agreement, which sought voluntary limits on countries’ carbon emissions, has been a key rallying point, especially since President Donald Trump announced in 2017 that he would withdraw the United States from the agreement, saying it put U.S. economy at a global disadvantage. The Episcopal Church has been involved in the We Are Still In movement, in which cities, states, companies, faith organizations and other groups have pledged to maintain the commitments of the Paris Agreement even if the U.S. government won’t. Resolution A018 specifically encourages Episcopalians to participate in that movement. The Episcopal Church should “set an example, in the spirit of the Paris Climate Accord, by making intentional decisions about living lightly and gently on God’s good earth, for example, through energy conservation, renewable energy, sustainable food practices and gardening,” the resolution says. Care of creation has been identified as one of three top priorities of the Episcopal Church, along with evangelism and racial reconciliation, during Curry’s tenure as presiding bishop, and General Convention’s numerous resolutions addressing environmental stewardship date back decades. Andrus has been at the forefront of that advocacy and has regularly led delegations on behalf of the presiding bishop to United Nations gatherings on climate change. The next U.N. Climate Change Conference, known by the shorthand COP24, will be held this December in Poland. “This summer the Episcopal Church took a historic step and committed itself through multiple resolutions to keeping the Paris Agreement,” Andrus said, adding that Episcopalians are part of “a great movement of faith people” fighting for action against climate change. Andrus recalls speaking to Brown while both were attending the COP23 event last year in Bonn, Germany. The governor shared with Andrus his belief that “faith is important to justice work, as a foundation to climate action specifically,” and when Brown mentioned holding a multi-faith service to kick off his Global Climate Action Summit, Andrus suggested Grace Cathedral. Since then, Young’s staff at the cathedral have been planning for the service, as well as for hosting 20 workshops this week that are affiliated with the summit, which will be based at San Francisco’s Moscone Center. Grace Cathedral also has become a hub for environmentally themed artwork thanks to Sukey Bryan, the cathedral’s artist in residence. She used a construction wall as a canvas to depict a river. Fire sculptures and tile work featuring ocean waves can be found around the building. 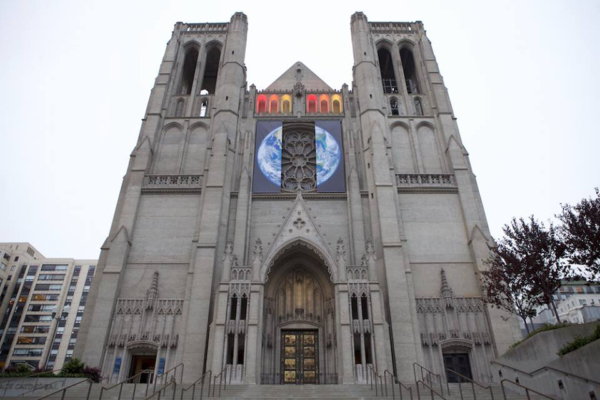 Parishioners entering the cathedral are greeted by Bryan’s 70-foot banners featuring oak trees, and a giant planet Earth hangs from the cathedral’s front window. “Climate change was one of the big truths we wanted to talk about through this year,” Young said. He added that he is a surfer and has seen firsthand the impact of a changing climate on the ocean water where he surfs. As water levels rise, he has been told the road he takes to get to the ocean someday will disappear. “I think there’s a sense of hopelessness when it comes to the climate. There’s a sense that nothing we do will matter,” Young said, especially with the federal government no longer behind a global solution. But he hopes this week’s summit and the Sept. 12 service at the cathedral will bolster people’s spirits and encourage them to work toward practical outcomes. “I really believe that when you gather people together to work on a problem, novel solutions come up,” he said.